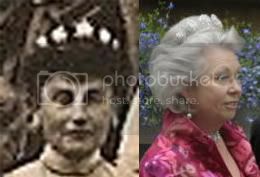 Christina, sister of King Carl Gustav of Sweden wore a Tiara that reminds me of one that Luisa had on a photo. Is this maybe the same Tiara? Christinas sister Brigitta married a prince of Hohenzollern-Sigmaringen, and you know that Luisa was married into the H-Sigmaringer family, too. Maybe that´s the Tiara and Christina borrowed it. The photo of Luisa is not so good, sorry. They had the thought that if Leopold didn´t want the throne of Spain Friedrich Eugen should take it. But he didn´t want to. Three Thurn und Taxis Queens! A pity it wasn´t so. Life is more than just crowns. FE was more a homely man. An "adventure" like Spain wasn´t attractive to him. I can understand. But hey a Queen Louisa. Absolutely ! Look what happen to the Kings later on who get driven from their thrones or assasinated.